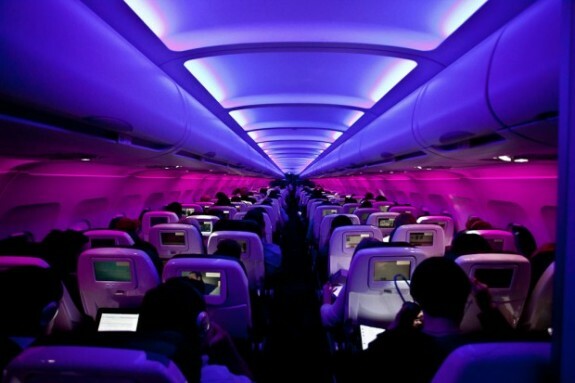 In ways large and small, Virgin Atlantic offers the most hip and happenin’ scene in the sky. We’d argue there’s no cooler travel brand, among airlines or otherwise. Can’t deal with economy class but can’t afford business? Virgin Atlantic’s premium economy service doesn’t cost that much more and offers a separate check-in area, priority boarding, dedicated cabin crew and seats akin to those in business class of some other airlines. Not incidentally, Virgin Atlantic’s off-shoot airlines — Virgin America (see below) and Virgin Australia — are super cool too. From their London hub, to destinations near (i.e. Glasgow) and far (i.e. Cape Town and Sydney). 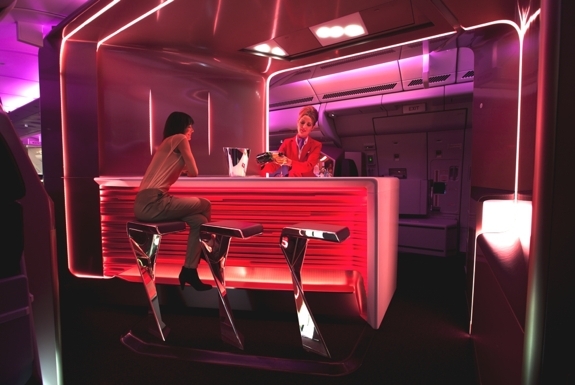 A new partnership with Delta will probably see Virgin Atlantic join the SkyTeam alliance. At the moment, Vigin’s Flying Club is independent. While Virgin Atlantic (above) is cool in a cheeky and hip sort of way, Singapore Airlines is at the opposite spectrum of cool — elegant and sophisticated. The best economy class food, the best economy class service and the most economy class legroom of any airline. Of course, Singapore’s business and first class is wonderful too. Singapore Airlines often has some great sales but their regular fares are on the expensive side. Throughout Asia, with a surprisingly large presence in Europe. Note that most of their short haul routes are really operated by their partner airline, SilkAir. Star Alliance member. SilkAir essentially shares Singapore Airline’s frequent flier program. Emirates‘ first (aka Diamond) class seats on one of their Airbus A380s — WOW! If we could have one free ticket on any airline, in any class and on any airplane, we’d choose that. Your “seat” is really more of a suite (photos below) with doors that close. Inside that cocoon of luxury you’ll find a mini-bar, complimentary pajamas, ambient lighting, 600 hours of on-demand entertainment on a 23-inch widescreen LCD and a comfy seat that electronically folds down into a full-length bed. Oh, there’s also a lounge/bar, spa with hot shower and seven-course meals. And after you land, a chauffeur will give you a complimentary ride to your hotel or home. 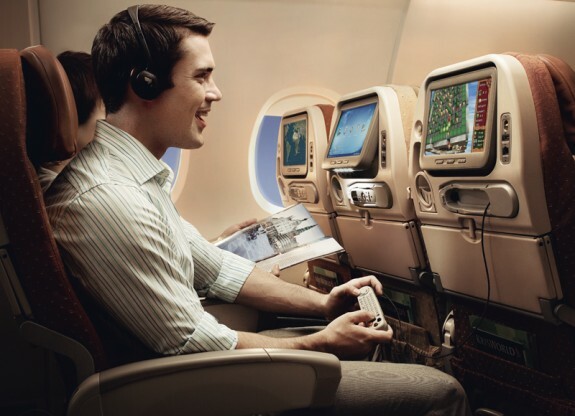 Some of the cool factor trickles down to the lowly fliers in economy class — Emirates has the best in-flight entertainment system regardless of what seat you’re in. The price of a ticket in the aforementioned Diamond class. You could buy a very nice actual diamond — or a decent car — for the same amount. Emirates is not part of a major alliance, but their Skywards program partners with a handful of airlines including Qantas, Jet Blue and JAL. Qatar Airways‘ economy class seats offer the best combination of seat recline (34 inches) and width (18.9 inches) of any airline. More than 1,000 on-demand entertainment options in every class of service. Those lucky few first class passengers with extra time in Qatar get use of the single greatest airport lounge anywhere: private rooms, high tea and a world-class spa. There’s no premium economy class. Though you can earn and redeem miles on several other airlines, Qatar is not part of any alliance — your frequent flier status won’t transfer. Skycouch — lie-flat seats previously featured on Spot Cool Stuff. 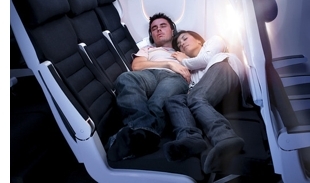 Several airlines have cool touches in first class, but Air New Zealand brings innovation in economy class too. Skycouch features flip-up cushions that fill the space between the end of your seat and the start of the next row. Seat belt extenders let you stay buckled when laying down. It’s absolutely awesome for traveling with young kids. Pretty great if you’re a couple wanting to snuggle up too. Air New Zealand has the coolest safety videos — by far — of any airline. Their most famous video features flight attendants wearing nothing but body paint (see it, below), but for pure comic value we’re partial to the Richard Simmons exercise version. Also cool: the OneUp program, which allows international passengers to bid for an upgrade a week before departure. If you are tall (eg. around 6″ or 1.8m) you won’t be able to lay on a Skycouch without bending your legs. Mostly around Oceania. Long haul routes extend to London, Japan and the west coast of North America. Star Alliance member. There’s also a partnership with cool-in-its-own-right Virgin Australia. LV Air, a new Las Vegas based airline that will supposedly launch sometime in 2013, promises a luxurious — and unusual — in-air experience. Press reports talk of reclining beds, live plant walls, translucent bulkheads, holographic safety instructions and, being a Vegas-centric airline, a “private gaming experience.” But details are sketchy. We’ve contacted the airline and hope to learn more. Fiji Airways is currently flying as Air Pacific. But their rebranding looks like it has huge potential. Check out our previous post previewing the new Fiji Airways. We hope to bring you a first hand report after it launches in June of 2013. 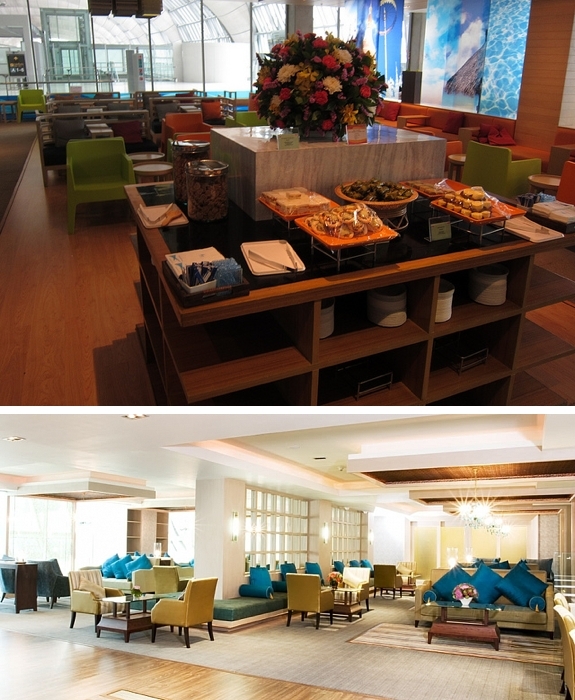 Every Bangkok Airways passenger gets use of the airline’s lounges at every airport they fly out of — no Priority Pass card or business class ticket required. This self-described “boutique airline” mostly delivers on its promise to deliver full-fare perks at a no-frills price. Meals are served on virtually all flights (including domestic). The service quality is high. Bangkok Airways even operates three of their own “boutique airports” in Samui, Sukhothai and Trat, Thailand. Bangkok Airways charges for checked baggage on all international flights. Most flights are from their hub in Bangkok (go figure) to destinations in Thailand and around Southeast Asia. But the coolest route goes from Hong Kong direct to the Thai beach island of Samui! It’s hard to think of two airlines more different than Air Berlin and Etihad, yet somehow those are the only partners in Bangkok Airways’ Flyer Bonus program. Every Porter Airlines passenger gets to use the lounge at the airline’s Toronto hub. Low fares, generous legroom, free airport shuttle bus service from downtown and complimentary on-board Jackson Triggs wine and Steam Whistle beer. Oh, and they have a racoon for a mascot. Porter exclusively flies Bombardier Aerospace turboprops. We quite like the Porter cabins — they are roomier and quieter than your typical turboprop — many fliers understandably prefer flying in jets. Eastern Canada and northeast USA with a hub at Toronto’s Billy Bishop Airport, which is significantly closer to downtown than YYZ. VIPorter Points is not affiliated with any other rewards program. Sad. A chic in-cabin ambience meets remarkably low fares. Other airlines have leather seats and live TV that’s similar to what’s on offer with Virgin America. But what about an entertainment system that also lets you order food and drinks from your seat, choose from 25 movies, send instant messages to other passengers and purchase credits to help offset your flight’s carbon footprint? There’s a standard and USB plug at every seat. And the cabin’s mood lighting (photo below) is rather cool too. They charge most passengers for checked bags. Urg! Mostly the United States, with a hub in San Francisco and a heavy focus on Los Angeles. They also serve three Mexican beach destinations: Cabo, Puerto Vallarta and Cancun. The Elevate program is decent, but with no other airline partners it’s hard to earn enough miles for free flights. There’s absolutely no airline with a sense of humor more on display than Kulula Air. 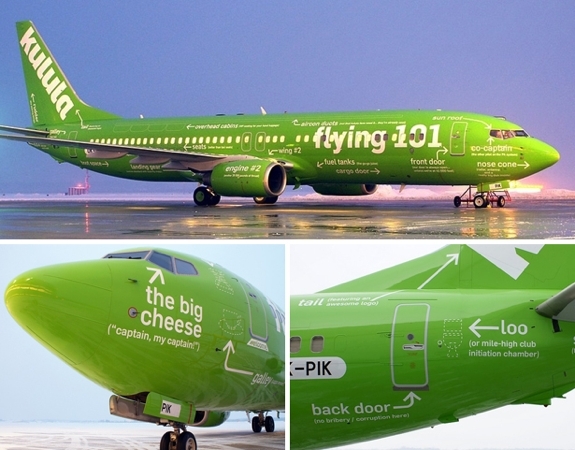 Most noticeable are the funny aircraft liveries (check out “Flying 101” below). They’ve also got off-beat in-cabin announcements, funny options on their telephone help line (“press 4 if you want to become the next president”) and unusual promotions (eg. your fourth wife flies free). Super cheap fares, including to a few destinations like Windhoek, Namibia that are expensive on seemingly every other airline. Once you get beyond the superlative humor and cheap fares, Kulula’s service levels, perks and on-time departure record is indistinguishable from your average no-frills airline. A handful of domestic routes around South Africa and regional international routes from Kulula’s Johannesburg hub. There’s not really a Kulula frequent flier program, but members of a OneWorld program can earn miles on British Airways cobranded flights booked through the Kulula website. And our final choice is . . .
Asiana offers high comfort and low fares in economy class. Business class passengers are sometimes treated to live musical entertainment. First Suite class passengers get to watch their movies on the largest personal screens in the sky — 32 inches! And all passengers earn valuable Star Alliance miles. 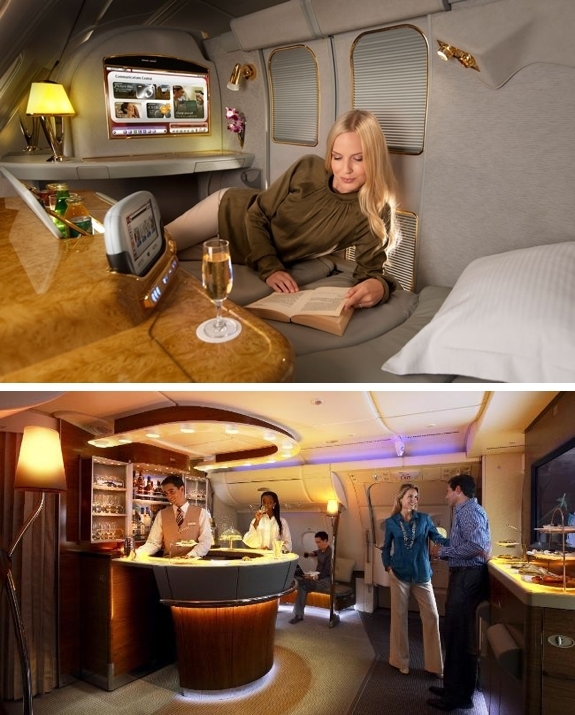 Etihad Airways has a high-end Diamond class similar to that offered by Emirates (see above). IndiGo. India has a surprising selection of high quality domestic airlines. Among that stiff competition, IndiGo stands out for the (relatively) excellent quality of their food, for their level of service and for their cheery, if slightly cramped, cabin design. Norweigan offers free wifi on select flights> (Free wifi is a sure way to win Spot Cool Stuff’s heart). Turkish Airlines has a premium economy service that rivals Virgin Atlantic’s (see above) and some of the best airline food around. They’re also in Star Alliance. Nice article and nice listing of great airlines.